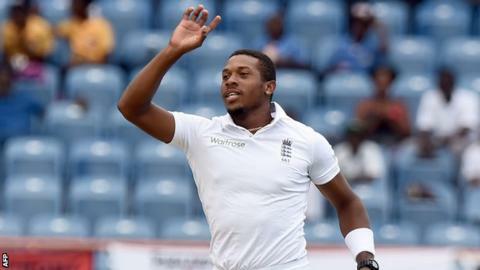 It was a fourth day of two halves for England in the second Test against West Indies in Grenada. At lunch after a very good morning session they would have been entertaining thoughts of wrapping up victory before the day was done; but West Indies fought back superbly in the final two sessions as England, not for the first time in this series, struggled to take wickets. They ran in hard, set interesting fields, and tried all they could, but the bowling was just too predictable to pose a threat on this slow, docile pitch. With four right-arm fast-medium seamers, everything is the same, which means the batsmen know where the ball is going to land and can play it with relative ease. What England desperately need is something unpredictable: whether that's a wrist spinner like Adil Rashid who can bowl variations; or someone like Liam Plunkett who can bowl fast, bowl different lengths and come round the wicket. "Take Ben Stokes' figures and Chris Jordan's figures, they're very good. But they're not penetrating. You're better off with bowlers who are expensive. We need someone who gets wickets. And it's all very well having bowlers who can bat, but we don't need all that batting on this pitch." It's not as if they can't afford to take a gamble - they've got so much batting that they have all the scope they need to pick somebody a bit different in the bowling department. In my opinion, playing all-rounders Ben Stokes and Chris Jordan in the same XI is a mistake. They are so similar in terms of their bowling style. Obviously England will have to assess the conditions on their own merits when they get to Barbados for the third Test, but I would certainly consider letting Jordan go. I have a lot of admiration for Jordan - he's an excellent fielder, a very capable lower-order batsman and a lovely athlete. But I just can't see him taking a stack of wickets. It may sound harsh, but when you compare him with someone like James Anderson, who is such a skilful manipulator of the ball, Jordan actually does very little with it. The other major disappointment of England's bowling display has been the performance of spinner Moeen Ali. Moeen's had a very average match - in general he's bowled too short and allowed the West Indian batsmen to get after him. He's struggling because he's been injured, and the England management have expected him to come back immediately, step off a plane and play a Test match. If you treated Graeme Swann or Derek Underwood like that, they'd probably do a good job, but Moeen is still finding his feet at Test level and doesn't have a wealth of experience to fall back on. Moeen bowled brilliantly in the home series against India - taking 19 wickets - but when he performs like this, you have to say England have been over-optimistic to think of him as a frontline spinner. Having said all that, you've got to give the West Indian batsmen a huge amount of credit for the way they played the England bowlers. At lunch they were in desperate trouble, but they really knuckled down and showed a great deal of discipline, which is not something that recent West Indies teams have been flattered by. Having a new coach at the helm can often make a difference, and you can only doff your cap in respect at the way they've responded to Phil Simmons's arrival. England have a stiff task ahead of them, but I still believe they can win this match. They'll need a golden spell on the final day, but they'll have the new ball - they have the opportunity to take wickets and create pressure.